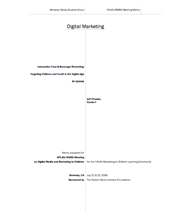 In April 2007, the Berkeley Media Studies Group and the Center for Digital Democracy released the report "Interactive Food & Beverage Marketing: Targeting Children and Youth in the Digital Age. "1 It provided an overview of contemporary developments in the interactive media marketplace, and explained how food and beverage companies are using new digital media to promote their products to young people. As that report documented, economic, institutional, and technological trends are transforming the nature of marketing in the digital era, ushering in what is now called the "marketing eco-system," which encompasses not only television, but also a growing number of digital "platforms," from online games to cell phones to 3-D virtual worlds. In the year since that report was released, the techniques we identified are still very much in practice, and many of them have been further refined, as food and beverage marketers combine them in a variety of integrated cross-platform campaigns. The interactive marketplace has experienced significant growth and expansion. Internet advertising spending has increased. Behavioral targeting is becoming more sophisticated. And "social media marketing"—reaching young people through highly popular websites such as MySpace and Facebook—has grown dramatically, spawning a new generation of data mining and viral techniques. With more and more youth downloading videos on YouTube and other online services, advertisers are perfecting their ability to transform that practice into a lucrative business model. This memo will highlight some of the recent developments in interactive marketing, and how they are influencing the strategies that food and beverage companies are using to target young people. We will also briefly summarize current public policy debates over contemporary digital marketing practices, and suggest some key questions for health professionals to address in order to develop effective strategic interventions on behalf of children and youth. There has been continued growth of interactive marketing technologies that track, collect, and analyze the online activities of users, in order to engage in behavioral targeting. According to a recent New York Times article, five companies alone—Yahoo, Google, Microsoft, AOL and MySpace—record at least 336 billion data "events" each month.14 A June 2008 eMarketer overview predicts that spending for behavioral targeting will grow from $775 million this year to $4.4 billion by 2012.
and the products they put in online shopping carts. Social media marketing — Penetrating the "social graph"
Social networks offer a wealth of opportunities for targeting individuals. At the core of MySpace's new marketing service, announced last year, is a unique "hypertargeting" system. The company tells advertisers it can create a "detailed profile of each user and their friends, including age, gender, location and interests," offering access to the valuable demographic groups that frequent its platform. Its media kit promises potential clients access to its 6.2 million users between the ages of 15-17 (or 57 percent of all online teens), making it the "#1 most viewed site" for that age group.25 "MySpace users want to share personal information—it's a fundamental part of how they express themselves and connect with others," the kit explains. "The freely expressed data in a user's profile offers marketers more authentic, powerful, and direct targeting beyond common proxy methods." By combining registration data ("Personal demographic information provided by MySpace users when they become members") with profiling data ("Freely expressed information by consumers about their passions and interests"), MySpace promises to deliver "next-generation targeting." Among the 12 major advertisers that signed up for the initial Facebook "social ads" launch was Coca-Cola, creating a Facebook page that invited users to add an application to their account called "Sprite Sips," which enabled them to "create, configure and interact with an animated Sprite Sips character." U.S. consumers can insert a PIN code found under the cap of every 20 oz. bottle of Sprite , in order to "unlock special features and accessories." Such tactics can encourage over consumption as users purchase more Sprite to get more bottle caps. The animated interactive character also "provides a means for interacting with friends on Facebook," serving not only as a fun way to pass the time online, but also as a way to "leverage Facebook's natural viral communications to spread the application across its user base. "33 Thus, as young people send messages among their circle of friends, the branded animated character becomes part of the communication process. Facebook introduced another new ad program late last year called "Beacon," which enabled advertisers to post announcements on members' news feeds whenever a user purchased a product or engaged in other activities either on the social network itself or with Facebook's outside advertising partners. The practice, launched during the holidays, quickly generated controversy as some Facebook members became alarmed when gift purchases and other transactions involving Facebook's advertising partners were transmitted to their friends. Privacy advocates (including the authors of this report) raised questions in the press about the service, and Moveon.org launched an online backlash on Facebook's own site. Companies such as Nielsen and BuzzLogic have developed software to monitor behavior on social networks, in order to help marketers identify and encourage key "influencers" who can help promote their brands. For example BuzzLogic bills its "Conversation Targeting" product as a "social media measurement system" that analyzes blog conversations and the network of links connecting them in order to identify where ads can be precisely placed. As the company explains: "Measurement is no longer simply about eyeballs and Page Viewsit's about relationships, conversations, and the degree to which you are influencing consumers. "38 New software applications are also making it possible for almost any individual or company to create a social network, and a host of new niche social networks have already been launched to tap into users using video programming, mobile phones and other emerging media. Some food and beverage marketers are creating their own social networks, stocked with engaging multi-media amusements that are also sophisticated data collection tools. Pepsi's "Youniverse" launched a "beta" for a social network targeting European fans of football. It allows users to compare their "Visual DNA" with famous stars of the game through a "personality test [where] you have to answer the questions by choosing the appropriate images to get your psychographic description," (surrendering detailed personal information in the process). This accomplishes two goals for the company. First, it prolongs engagement with the brand by giving the user something to do on the site. Second, the personal info the user provides can be used by PepsiCo for future target marketing campaigns. Behavioral targeting applies to video as well, and technologies for analyzing and tracking user interaction with online video and multimedia content are becoming even more sophisticated.44 In addition to what's called pre- and post-rolls, online videos can be surrounded by an interactive ad border, have engaging animated or viral calls to action, or feature an "overlay" pop-up to take over the entire video screen. These new interactive ad formats permit data collection, instant messaging, and advanced targeting.45 Ad agencies have also been researching how teens react to advertising within episodic online series (dubbed "webisodes"). In-game advertising continues to grow, along with the videogame industry itself (which now rivals the film industry in annual revenues58). Virtual worlds are also playing a growing role with marketing campaigns, as products and services are woven into these immersive online environments. Advocates and others have briefed the FTC, FCC, members of Congress, and several state attorneys general on the role digital marketing is playing in the youth obesity crisis. For example, with input from our report in May 2007, the Federal Trade Commission requested data on digital techniques for its report on marketing data it collected August that year from 44 of the major food, beverage, and quick service restaurant companies. The report, which was mandated by Congress, is due for release in the summer of 2008. It is expected to cover both traditional advertising and new media marketing targeted at children and adolescents. However, since the information solicited from the companies covers only the activities and expenditures during 2006, it is unlikely that the FTC study will be able to document the full scope of contemporary marketing practices. Key questions remain for advocates and policy makers concerned about the effects of food and beverage digital marketing targeting children and youth. Among the key issues are 1) assessing and prompting or supporting regulatory action; 2) promoting self-regulation; and 3) informing policy makers, parents, and the public about the problem and potential remedies. How could a focused legal and regulatory research effort identify potential cases of unfair and deceptive interactive food and beverage marketing practices that the Federal Trade Commission could investigate? Is the use of such techniques as "immersive multimedia advertising content" or behavioral profiling to promote youth consumption of unhealthy food and beverage products possible grounds for a successful FTC intervention? Would such an effort be also useful in generating significant press interest and the attention of policymakers, and help build pressure on industry to address digital marketing concerns? How might pending or developing FCC policies which regulate wireless, wireline, and cable communications address food and beverage advertising campaigns targeted to children and youth? Given the growing role of mobile marketing with food and beverage products, how might potential FCC regulation protect children and youth in this area? Given the online ad industry's own self-regulatory efforts in such areas as tobacco and alcohol promotion, would a series of meetings with key officials at Google, Microsoft, Yahoo, and AOL, possibly lead to new corporate policies which could limit marketing of obesity-linked products to children and youth? What strategies should advocates and health experts develop for responding to the forthcoming FTC report to Congress on digital food marketing? What are the technological tools, either now on the market or forthcoming, which could be used by parents to block certain forms of interactive advertising? Are there key research gaps into the effects of interactive marketing on child and youth that scholars should address? Would the convening of a working group of scholars tasked to analyze the potential relationships of various digital techniques and youth obesity be able to play a timely critical role? Given the overall lack of knowledge by the public and some public health advocates about the state of interactive marketing and its impact on children/youth health, would a series of in-person briefings and additional online resources contribute to a more informed and proactive field? Similarly, since many federal and state officials are also now just beginning to address digital marketing concerns, would briefings on digital marketing and youth obesity help build greater awareness and potential political support for hearings and possible regulation? At minimum, given the rapid evolution of the digital marketplace—and the active involvement of food and beverage companies targeting children—a robust monitoring system must be established to collect, analyze, and publicize the latest digital techniques. This memo was prepared prepared for the NPLAN/BMSG meeting on digital media and marketing to children, July 2008. 14. Louise Story. To Aim Ads, Web Is Keeping Closer Eye on You. New York Times , March 10, 2008. The author of this report assisted the reporter for this story. 17. Steve Warshaw, vice president, Homescan/Specta, quoted in: Steve Smith. Bringing BT Home (Part I). Behavioral Insider , May 18, 2007. 18. Mindset Media Press Release. 24/7 Real Media Becomes First Network to Deploy Psychographic Targeting from Mindset Media. April 28, 2008. Available via: http://www.mindset-media.com/aboutmm-press.php; Mindset Media. Quantitatively profile your target psychographics. 22. ContentNext Media. Social Media Deals Report: A Special Report from ContentNext Media. Q1 '07 Q1 '08. June 2008. Proprietary report. 25. MySpace Targeting Capabilities: Reaching the Right Consumer in a 2.0 World. February 2008. 30. As a recent Microsoft presentation on "Changing Media Behavior and the Impact of Retail" explained, "Community will soon become the entry point to the Internet and will frame the entire Internet experience ... Online communities and the buying process will be integrated and linked." Alex Marks. Changing Consumer Behavior. Microsoft . Available as pdf: http://www.iabuk.net/en/1/events2008engageforshopping.mxs. 31. Facebook Press Room. Facebook Ads Launches with 12 Landmark Partners: Leading Brands Seek Trusted Referrals on Facebook Through New ad System. November 6, 2007. Available via: http://www.facebook.com/press/releases.php?p=9171. "Facebook gives marketers valuable metrics about their presence and promotion on Facebook. Facebook Insights gives access to data on activity, fan demographics, ad performance and trends that better equip marketers to improve custom content on Facebook and adjust ad targeting." 39. Coca-Cola Hunts for Social-Net Formula. Brian Morrissey. Adweek , April 7, 2008. 47. Arby's Rescue Brigade Seeks Consumer Member. Marketing Daily. May 2, 2008. 48. Gail Schiller. Pepsi to launch Internet series. Hollywood Reporter. March 17, 2008. 68. How to harness this ethnic youth culture" and "metropolitan mindset" to promote "buzz" and why they are at the "intersection" for the "urban consumer market" was a theme of the report. The influence of this group on "super cities" was also cited, including New York, Los Angeles, and Chicago. ARF. Understanding the Urban Consumer. February 7, 2008. Available via: http://s3.amazonaws.com/thearf-org-aux-assets/downloads/cnc/multicultural/2007-02-07_ARF_Multicultural_OMobolade.pdf.